The BLACK+DECKER LSW36 40V Lithium Ion Sweeper has an efficient design that easily clears debris from hard surfaces like patios, decks, walkways, driveways and garages. Its soft grip handle provides added comfort during use. 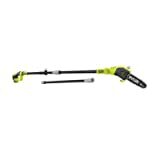 Its blow tube with built-in scraper allows users to loosen matted leaves and stuck-on debris. The lightweight, cordless LSW36 Sweeper. Power Command variable speed setting. 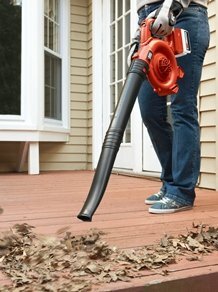 Power up your yard cleanup with the cordless Black & Decker 40-volt Lithium Sweeper (model LSW36), which eliminates the weight, noise and hassles of gas-powered equipment. 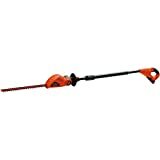 It’s powered by Black & Decker’s high-powered 40-volt lithium battery system, which offers power, excellent runtime, and the versatility to share batteries with other tools within the system. Black & Decker’s 40-volt lithium-ion system offers numerous benefits over older battery technologies and gas options, notably the ability to put more power into a small and compact battery. Lithium batteries have a longer lifecycle than other types, and they also hold their charge longer when taken off the charger. This means that once charged, a lithium battery is always ready to use. The included Energy Star-rated fast charger fully recharges the battery in about 1 hour. Ideal for hard surfaces like patios, decks, walkways, driveways, and garages, the Sweeper has an efficient design and a 120-mph air speed to make quick work of debris. It features Power Command controls for adjusting speed for maximum run-time or maximum power. 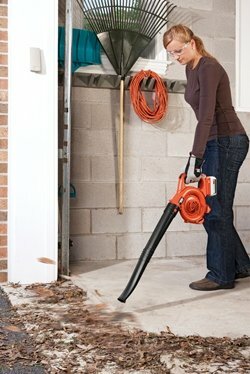 The blow tube has a built-in scraper that enables the Sweeper to loosen matted leaves and stuck-on debris. 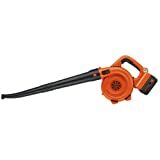 Weighing in at just 4.7 pounds, this blower is light enough for anyone to use for extended periods. And it features a comfortable soft grip handle that’s large enough for use with gloves. 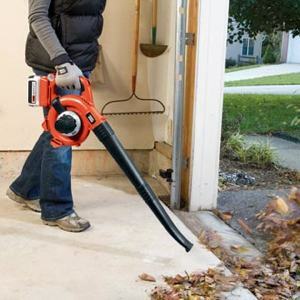 The Sweeper’s electric motor greatly reduces the roar that’s common with gasoline blowers to protect your hearing and reducing noise pollution. It’s rated at 66 dBA. 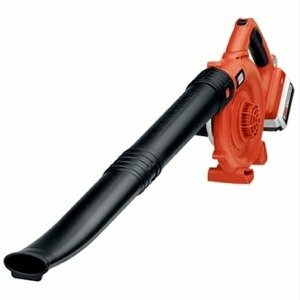 Ideal for blowing debris from hard surfaces. Clears patios, decks, walkways, driveways and garages. Low-noise design allows for quiet operation.